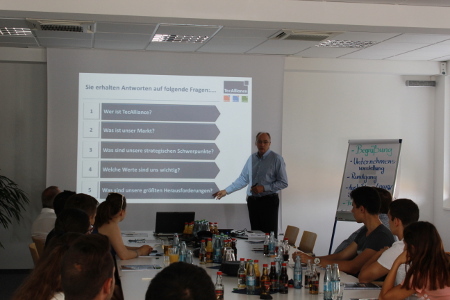 As part of the four-week orientation seminar organised by the Duale Hochschule Baden-Württemberg /DHBW (Baden-Wuertemberg Cooperative State University), fifteen pupils from seven different European countries visited the TecAlliance site in Weikersheim on 11 August 2015. The goal of the “Summer in the Castle 2015” seminar held on the Bad Mergentheim campus was to persuade international students to come and study at the DHBW. For TecAlliance, it was also an opportunity to further our search for highly-qualified young staff. In its role as a DHBW-affiliated training company, TecAlliance provided pupils with an insight into the company. Following Managing Director Jürgen Buchert’s welcome speech and introduction to TecAlliance, Ralf Pelkmann, Vice President Information Management – TecRMI showed the youngsters around the site. Afterwards the TecAlliance’s current DHBW students gave a presentation about their courses and talked about their experiences of Dual Study programmes combining theory and practical experience. Finally the participants had the chance to ask questions and clarify any remaining points. TecAlliance Managing Director Jürgen Buchert introduced the company to the international pupils. For some years now, TecAlliance has provided the opportunity for dedicated school-leavers to obtain a Bachelors degree while studying at the DHBW (Baden-Wuertemberg Cooperative State University) Mosbach, Bad Mergentheim campus. Further information on Dual Study programmes can be found on the TecAlliance homepage (https://www.tecalliance.net/en/career.html).